Things You Should Gift Yourself This Women’s Day Coz U Deserve It! When we think of raincoats, style is not mostly an aspect in mind. The main idea is basically to ensure that we remain dry when out in the rain. But while we concerned about our style for the rest of the year, why sacrifice it during the monsoon? We ask because there are ways in which we can look stylish while being well-protected from the rains. 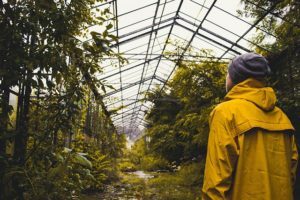 Through this article, we shall be delving into the nitty-gritties of rainwear, right from its history and popular materials to the trending designs that attract the eye. Till the early 1800’s, the concept of rainwear wasn’t really in the picture. Those looking for water-repellent outerwear would get the fabric treated with oil. But then, efforts to design proper rainwear began to pick up and found success in the 1820s. Charles Macintosh, a Scottish chemist, was experimenting with naptha (a by-product of tar) when he discovered a way to create waterproof fabrics. This paved way for the Mackintosh raincoat. Since then, numerous improvements have been made to the design which has lead to the creation of the raincoats we know. Many of these improvements occurred during the World Wars out of necessity to help the soldiers in the trenches. Now, there are numerous types of raincoats made from various fabrics in the market. Since, the primary purpose of the fabrics used in raincoat is to repel water, different combinations have been tried and implemented to achieve the same. In today’s raincoats, you shall fabric used to be a blend of any of these following materials: cotton, polyester, nylon, rayon, wool, wool gabardine, vinyl, microfibers etc. Depending on the kind of fabric, it is treated with chemicals and other waterproofing materials. First, you need to be clear about your requirements. If you happen to be someone with a active lifestyle with activities like cycling or jogging, consider opting for shorter, cropped styles that also allow free movement of the legs. Also, look for breathable fabrics in these styles to avoid getting drenched in sweat. Those not into an active lifestyle can go for classic options like macs and trench coats. It’s timeless style gives an incredible gentlemanly vibe. Once you are clear of your requirements, understand the three types of raincoats you shall find in the market – water-resistant, water-repellent and waterproof. Water-resistant raincoats can withstand rains for a short while but under heavy rains, you shall be drenched. 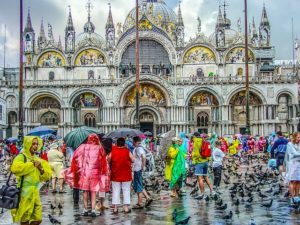 To avoid that drenching, opt for water-repellent raincoats. These garments have been crafted in a way that ensures the outer layer itself repels water and keep moisture away. But if you are looking for complete protection from rains, pick up waterproof raincoats without a second thought. These raincoats are tested to obstruct water penetration into the garment. So, unless you intentionally want to get drenched in the rains, this should be enough to keep you dry. 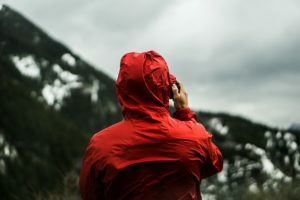 Now that you have a clearer picture about the smaller details of raincoats for men, let’s have a look at the some of the popular styles that are available in the market today. We shall also address some of the common do’s and don’ts of these styles. If you are living in a city and wear suits to work, a lightweight trench-style raincoat can blend well with your formal attire while keeping you dry. Such raincoat would also keep you warm from mild temperature dips. For days when the rains seem to be heavier than usual, opt for rubberized cotton or PVC raincoats. Made from waterproof materials, these offer complete coverage and protection from the rains. They are also less expensive than fabric coats. 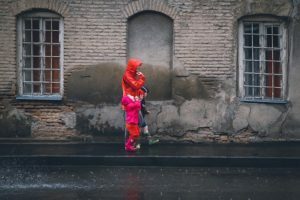 In areas where constant rainfall is common along with drastic temperature drops, an anorak or a parka type of raincoat should definitely be considered. These not only keep you warm but also offer a water-proof finish to top it off. Those into heavy outdoor activities like construction, fishing etc. might find long PVC raincoats to be cumbersome. So instead, you should opt for shorter PVC raincoats and pair them with waterproof pants. This gives you much-needed freedom in terms of body movement at work. So, that was our guide into raincoats for men that you should help to make the right pick this monsoon. For more such glimpses into fashion, makeup and accessories for all seasons, continue to follow InfiFashion and get regular updates on all things fashion. Couple Gifts That You Need To Snap Right Away.